Deal Book. We seldom make money in the stock market by “accident” because the most likely place for accidents to happen is in the “volatility zone” (N) of stock market pricing and we never own any of the companies that are trading in (N) in the Perpetual Bond™ (B) which is the only kind of investment that we’ll make. Of course, there are “up accidents” (please our Post, The All Canadian Four Play, October 2012) of which there are few and “down accidents” of which there are many. Please see, for example, our Post, (B)(N) RIM Research in Motion Limited, November 2012, but that is far from being an exception in the rather long list of “down accidents” that we have reason to avoid and which usually affects at least half the market and sometimes as much as two thirds and even more. The “expected return” of a portfolio of the stocks of companies all of which are trading in (N) is, not surprisingly, zero or less. Please see, for example, two of our Posts from June, Capital Safety in the Market Lane and NASDAQ 100 – (B)(N) There And Done That, for information on the “Contra Portfolio” which is all (N) as most investors are finding out “accidentally” and “anecdotally”, as it were. It is surely also not a surprise that in order to avoid “accidents” we need to keep our heads up and not be talking on our cell phones (to our broker, for example). We’ve talked about the two Canadian railroads in our earlier Post (please see, (B)(N) CP Canadian Pacific Railway Limited, November 2012), CP in the context of Pershing Square Capital Management and their efforts to correct what they saw as a “down accident” which created for us a rather pleasant “up accident” because we were already there way before them. 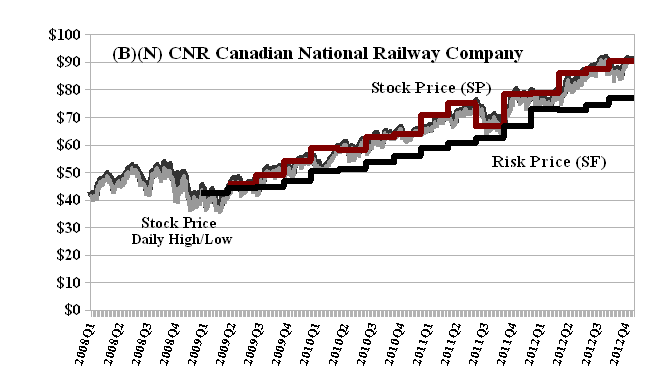 Today we have the further encouraging news that Cascade Investment LLC had upped their stake in the Canadian National Railway to more than 10% representing an investment that is currently worth about $4 billion (The Canadian Press, December 12, 2012, Microsoft founder Bill Gates ups stake in Canadian National Railways to 12%) and, again, fortunately, we were in the right place at the right time. Go figure. Canadian National Railway Company is engaged in the rail and related transportation business. The Chart shows that we have held CNR continuously since $45 in 2009 and are still holding it now at $98 (up from $85 in November). We generally don’t care about the purchase price (subject to the rule that the stock price should be plausibly above the Risk Price (SF)) but “selling” is a discipline and can be done by actually selling all or part of the stock or by taking a long put position to protect the price that we have over market volatility. Please see our Post, The Wall Street Put, August 2012, for more information on the buying and selling discipline.